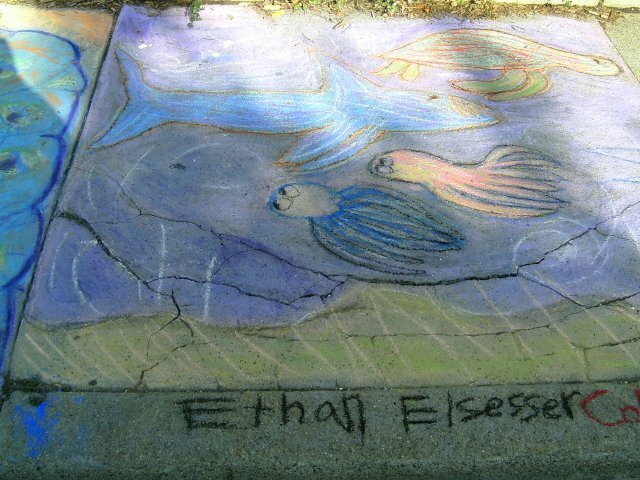 For several years we sponsored a sidewalk chalk drawing event, in conjunction with the Lotus Music and Arts Festival held here in Bloomington every September. We sent out invitations to all the local primary and secondary schools, and reserved squares of the sidewalk in front of our store for interested individuals or schools. Grant Street in front of the store was blocked off for the Lotus Festival, so the drawing would often spread out into the street, and across the street to the sidewalk in front of the public library.